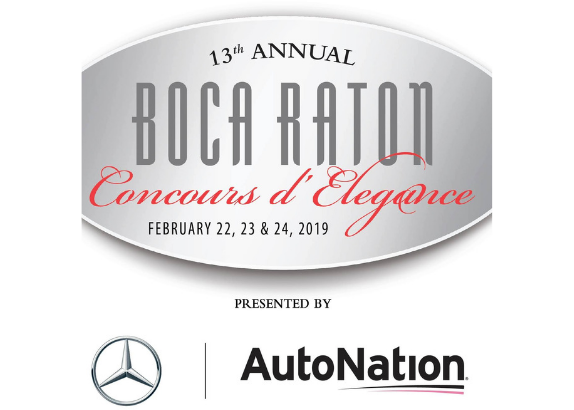 BOCA RATON, FL – The 13th annual Boca Raton Concours d’Elegance presented by Mercedes-Benz and AutoNation on February 22-24, 2019 at the Boca Raton Resort & Club announces Jay Leno, from the “Jay Leno’s Garage” television show, as the headline entertainer and celebrity judge. Jay will be presenting the “Big Dog Garage Award” to his favorite automobile and motorcycle during the Sunday, February 24th judging on the Show Field. Auto enthusiasts, will celebrate with Marque of the Year, Bentley Motorcars on their 100th Year Anniversary. Friday, February 22: Kicks off the weekend of events with the duPont Registry™ Live Hangar Party at Atlantic Aviation at the Boca Raton Airport. Guests will experience gourmet tastings from more than 30 of South Florida’s finest restaurants and indulge in an array of fine wines and spirits as well as live entertainment. Guests can also peruse an impressive selection of exotic cars, motorcycles, extravagant boats, private jets, premier vendors and more. Saturday, February 23: Features educational automotive seminars designed for the true automotive collector enthusiast followed by the Grand Gala Dinner, Auction & Show. Prior to dinner, guests will enjoy a wonderful cocktail hour and will have the opportunity to bid on a unique array of items at the silent auction. Immediately following the cocktail, guests will be served a gourmet dinner during which they will have the chance to bid on one-of-a-kind trips and experience packages, luxury jewelry, and more at the live auction. Additionally, guests will enjoy the presentation of the Racing Automotive Lifetime Achievement Award to Ryan Hunter Reay and National Automotive Lifetime Achievement Award to Mercedes-Benz USA President & CEO, Dietmar Exler as well as a stellar performance by one of the most respected and successful comedians in the country, Jay Leno. Sunday, February 24: Sponsored by Rick Case Automotive Group, Sunday’s all day-event features the Boca Raton Concours d’Elegance automobile and motorcycle exhibition. The day starts with an exclusive private brunch where guests can join Jay Leno and Wayne Carini, Host of TV Show Chasing Classic Cars for an intimate brunch with a Q&A session. Moderated by: and Keith Martin, Publisher of Sports Car Market Magazine: ($1,000 per person). Following the exclusive brunch, Celebrity Judge Jay Leno will walk through the show field meeting automobile and motorcycle owners and event attendees as they search for their favorite automobile and motorcycle to present the Jay Leno Big Dog Garage Award. Guests from around the world will experience an automotive showcase like no other, featuring vehicles and motorcycles from an array of time periods. Celebrity Judge Jay Leno will join an expert panel of judges including Chief Judge Dr. Paul Sable and Steve Moskowitz, Executive Director of AACA and Keith Martin from Sports Car Market Magazine with Jay Quail, CCCA Executive Director. Additionally, Grand Marshal Wayne Carini, host of Chasing Classic Cars joins the group for another stellar year along with Master of Ceremonies Bill Rothermel and Tom duPont, who will select the finest vintage, antique, classic and exotic vehicles based on period, presentation and overall style. The 2019 Collector of the Year, Robert Jepson of Savanna, GA will be feature his Vintage Auto Collection including the debut of several vehicles: 1920 Stutz Bearcat (debut); 1926 McFarlan, Model 145 TV – Six Passenger Touring (debut); 1927 Isotta Fraschini LeBaron, Model 8-AS Dual Cowl Phaeton (multiple award winner); 1928 Stutz BB Cabriolet by Phillips (CCCA First Place Winner); 1929 Chrysler Dual Cowl Phaeton, Model 75 Custom (multiple award winner); 1930 Packard, Model 734S (debut). Once the show kicks off, guests are invited to walk through a series of vendor tents and enjoy a selection of gourmet food, wine and cocktails from more than 30 of South Florida’s finest restaurants at the Concours d’Gourmet Pavilion. *The 2019 Boca Raton Concours d’Elegance also marks the annual ACD Citrus Meet on the show filed. For additional information on the 13th annual Boca Raton Concours d’Elegance and a full schedule of events, please visit call please call (954) 537-1010. The website will provide up-to-date guest information. – (Sunday) Guests can join Jay Leno and Wayne Carini, and Keith Martin for an intimate exclusive brunch with Q&A. ($1,000 per person). – (Sunday) Automobile & Motorcycle Exhibition: ($100/person general admission or $150/person early admission with Concours d’Gourmet access). The Boys & Girls Clubs of Broward County (BGCBC) is a non-profit 501(c) (3) private agency, dedicated to helping young people improve their lives by building self-esteem and developing values and skills during their critical period of growth. Serving more than 12,300 at-risk youth, ages 6-18 each year from its 12 Broward County-area clubs, their purpose is to inspire and enable children to realize their full potential as productive, responsible and caring citizens. BGCBC has once again received the coveted 4 stars rating (out of 4 stars) by Charity Navigator for the seventh year in a row. Only 4% of the Non- Profits in the USA have achieved this level of excellence. Boys & Girls Clubs of Broward County is located at 877 NW 61st Street Fort Lauderdale, FL 33309. For more information please call (954) 537-1010 or view the website at www.bgcbc.org. AutoNation, America’s largest automotive retailer, through its bold leadership, innovation and its comprehensive brand extensions, is transforming the automotive industry. As of March 31, 2018, AutoNation owned and operated over 325 locations from coast to coast. AutoNation has sold over 11 million vehicles, the first automotive retailer to reach this milestone. AutoNation’s success is driven by a commitment to delivering a peerless experience through customer-focused sales and service processes. Through its Drive Pink initiative, AutoNation is committed to drive out cancer, create awareness and support critical research. AutoNation continues to be a proud supporter of the Breast Cancer Research Foundation and other cancer-related charities. Please visit: investors.autonation.com, www.autonation.com, www.autonationdrive.com, www.twitter.com/autonation, www.twitter.com/CEOMikeJackson, www.facebook.com/autonation, and www.facebook.com/CEOMikeJackson, where AutoNation discloses additional information about the Company, its business, and its results of operations. The Rick Case Automotive Group, honored as Automotive News’ one and only 2013 National All-Star Dealer for the Privately Held Dealer category out of 17,000 in the country, is one of the largest auto groups in America. Rick Case Automotive Group celebrated its 56th anniversary in 2018. With 16 dealerships in Florida, Georgia and Ohio, the Rick Case Automotive Group offers Maserati, Acura, Audi, Hyundai, Volkswagen, Kia, Mazda, FIAT, Alfa Romeo and Honda Automobiles & Motorcycles, including the World’s Largest Honda, Hyundai, Kia and Volkswagen dealerships located in Broward County, Florida. With a community-driven mindset and a commitment to philanthropy, life and business partners, Rita and Rick Case have dedicated their lives toward supporting and improving their community by developing and leading fundraising and awareness efforts that raised more than $50 million in South Florida alone. Rick Case Automotive Group’s national headquarters are located at 14500 W. Sunrise Blvd. in Sunrise, FL. For more information, visit www.RickCase.com. 3 Hot Events - Festival of Arts BOCA Opens Feb 28The International Beatles On The Beach Festival, April 25-28.